A sample lawn seed mix will show the types of grasses and weeds that are included. Depending on where you live the percentages as well as the type of grasses may vary. A good sample list will show a very low percentage of noxious weeds. It will also show a high percentage of germination. Examine various seed products at your local store. While you might have to pay a little more for quality seed, it is well worth it. A high rate of germination and a relatively lower level of weeds will make your life much easier. Your new lawn will also look much better as well. While it is impossible to keep all weeds out of a bag of seed, percentages of less than .03% should be typical. You will also have inert matter and some crop seed. Around 1% for inert matter and .01% is typical of these materials. Inert matter is chaf, dirt and miscellaneous matter sometimes manages to get included during the cleaning process. The origin of the grass will be shown when it is more than 5% of the total. This is a clue to help you decide if this grass mixture will grow in your area. Germination rates are also shown. Germination rates decrease as the age of the seeds increases and as conditions for growing become less than ideal. 80 to 90% is typical in ideal conditions. Finally the percentage of each type of grass is included. This percentage is by weight not quantity of seeds. 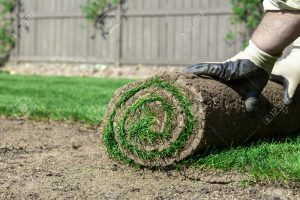 This indicates the type of grass and consumers should confirm that this is the type of lawn that will do well in the area they live. Also the type of lawn they wish to grow. 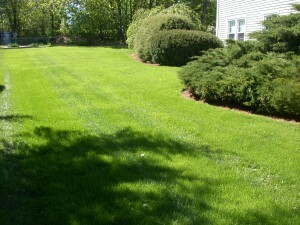 Many consumers opt for the less expensive option of seeding a new lawn rather than laying new sod. We decided to write a post about tips for seeding a new lawn to help our subscribers prepare the earth and choose the proper seed. The first tip is to choose good quality seed. Spend a few more dollars to purchase weed and disease free lawn seed. Spending a few more dollars now will save you a great deal of money in the future. No weeds or disease to be concerned about. The next tip is to choose the right grass type for the area in which you live. Some grasses do better in cooler climates while others are drought resistant and do well in arid climates. In addition to being adapted to where you live, is the lawn for decoration or will it receive a lot of traffic? Is there partial shading or will it have full exposure to the sun? How much tender loving care will the lawn need and do you have the time to spend on it? Read the labels to ensure that you purchase the correct lawn seed for your area and the local conditions it must tolerate. Next read the label and description regarding how much lawn seed you will need for your new lawn. Have your lawns measurements ready so that you purchase the proper amount of lawn seed. Note that percentages of grass types are based on the number of seeds of each type in the bag. Not all will germinate for a variety of reasons. All lawn seed will contain some weed seeds. These will grow and at some point you will need to deal with these weeds growing in your lawn. the label should indicate what percentage of seeds will be from weeds. Obviously the lower percentage you can get is better and will cost more as well. In the long run most consumers will agree that it is better to pay a little more rather than deal with a lot of weeds in the lawn. It can be tempting when installing a new lawn to just grade the earth and begin installing the new sod. This is one of the biggest mistakes you can make. If you would like a healthy lawn for the long term. There are a number of steps that should be followed when installing a new lawn. We will cover these steps in this post. Look for more details in future posts. The installation of your new lawn whether it is being done by yourself or by a professional company you have hired. 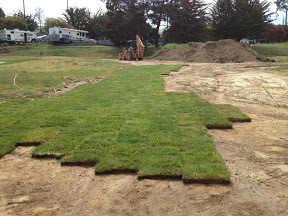 This will determine your expectations as well as how much your new lawn is going to cost to install. Examine the soil for weeds. Look for types of soil, condition of the soil, amount of debris, grade, need for adding healthy soil over clay for example. Remove all of the debris that may be on the surface or visible on the soil. Remove all weeds, water the soil, wait for seeds to germinate and remove the new growing weeds. Establish a rough grade based on leveling the soil and keeping in mind natural drainage. Measure your lawn area so that you have an idea of how much grass seed or sod you are going to need. If you plan on installing an underground sprinkler system, now is the time to do so before the grass seed is sown or the sod is installed. Establish the final grade. Depending on the size of your new lawn, you may want to use a rake or a larger instrument to level the lawn. This will also fill in low lying areas. Roll the soil to firm it up. This will also level it before installing the new sod or planting the new seed. Our next post will talk about planting new seed in your new lawn. One of the considerations consumers may want to take into account when they hire someone to provide landscaping lawn care services is what chemicals they use and whether these chemicals are harmful to the environment as well as to humans. In some cases fertilizer is applied that contains weed killer. In others weed killer is applied in a liquid form. For both situations, consumers should keep their pets inside. Also their children as well as themselves off the lawn for a few days and perhaps even until it has rained or you have given your lawn a thorough watering. At the minimum you want the weed killer diluted. Best of all to be absorbed into the ground where it will do it’s job dealing with any weeds that are in your lawn. If a heavy rain is forecast you may want to delay applying weed care to avoid the pesticide being washed away into the sewers etc. The ideal for most fertilizer and weed killer is to have a gentle rain. It will washe the material into the lawn where it can do the most good. Always read the instructions and follow them perfectly. If they say wear gloves, then wear gloves etc. This stuff can cause all kinds of damage to yourself as well as to children and pets. If should get some on their skin or somehow ingest it they may get quite sick. Keep everyone off the lawn for several days to protect them from any chance of being poisoned. In addition wash whatever tools you are using e.g. spreaders when you are finished. Remove all traces of chemicals from the spreader. Do this on the lawn and not the driveway. 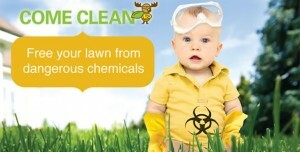 You might as well have any traces of chemicals watered into the lawn rather than run down your driveway. Some people will combine contracts for upkeep of their landscaping as well as lawn care. Consumers should be able to save some money when they combine services. For example if they have have both the lawn care and the landscaping updates and ongoing landscape care. This would include trimming, fertilizer, raking leaves etc in addition to the regular lawn care activities. You may even have to have your shrubs etc sprayed to protect them from bugs etc that can cause them to be sickly looking. Always have everything included in the contract. Make sure everything is clearly specified so that there is no misunderstanding of any kind. You can always update and / or change the contract in the future to make it more clear or to add or subtract items of activity that you no longer need. However the time to clarify everything is before you sign a contract and commit or at the time of renewal of the contract. For some people, landscaping and lawn care is act of love. They enjoy it so much and are really proud of the work that they do to keep their lawns and the landscaping of their property looking great. They also want the neighborhood to envy them and will strive to have the best lawn in the neighborhood. But most people either do not have the time or the desire to do their own landscaping and lawn care. They may not want to pay the money to a landscape company, yet they really do want to have a great looking property. It is a dilemma for these people because once your lawn begins to look bad it can take a lot of work to get it back. There are alternatives to spending a lot of money and still have a really nice looking lawn, that you and your spouse can be proud of. As long as you are prepared to spend an hour or two each week, you can have a great looking lawn without too much work or money being spent. The basic rule is hire people to do the hard work and you look after the easy stuff. Planting shrubs, digging up lawns and planting gardens is probably more difficult work than what most people want to tackle. Mowing the lawn, applying fertilizer and applying weed applications are in the middle of what some people consider easy and others consider hard work. Watering your lawn is very easy to do and just takes time to make sure that your lawn gets enough water to keep it healthy. Many people will even have automatic watering systems installed to water the lawn for them at the prescribed times. Decide what you like to do and are able to do and then make your decision regarding how much you want to spend. You may also need to budget for some trimming of the shrubs once a year as well or more often if you plant fast growers. Some consumers will cut their own lawn, but hire someone to add fertilizer and weed killer for them so they do not need to contend with this task. Ask for several quotes so that you have some idea of what the work you are planning to do is going to cost. Planting shrubs and gardens can be one set of costs, while trimming etc can be another. Next you need quotes for weekly lawn mowing, fertilizer four times a year and weed control as needed. Once you have these costs you can quickly decide whether this kind of landscaping and lawn care fits into your budget. Evaluate the costs. Then determine if you can fit this into your budget vs. how much work you want to take on yourself. Don’t forget to factor in the tools that you may need to do the work yourself. For example you obviously need a lawnmower and a fertilizer spreader if you plan to do these tasks. A fertilizer spreader is not too expensive, while lawn mowers can cost a hundred dollars or even much more if you purchase an expensive one. The last point we want to leave with you is that when you do the work yourself and see the results, the sense of satisfaction can be very enjoyable as well. Ever wondered what it takes to have the perfect lawn? One of your neighbors probably has a lawn that is close. You wonder what is he doing that your not? Well it turns out it is actually pretty easy to get a near perfect lawn. Which will be the envy of your neighbors and friends. It really will not take that much work. Perfect lawns and lawn maintenance is easy to achieve. It just takes a little time and tender loving care. The secret to the perfect lawn is regular care, regular watering when needed, regular fertilizer, cutting when the lawn has grown an inch or more and before it gets too long, and keeping debris and weeds away from your lawn. We will cover these issues in detail, however if you pay attention to these basics, your lawn will look great! All of these items are required, however if you keep up with the work, you will not get over whelmed and the lawn will look great. If you let it go for a few weeks, you may have a big job on your hands and that is no fun. Lawns need fertilizer at regular intervals. Even if you use a standard fertilizer without chemicals for killing weeds you will be away ahead in terms of a healthy lawn. The fertilizer companies offer specific fertilizers for the spring, the summer and the late fall. We recommend that you use these fertilizers and put them on your lawn following the instructions that come with the fertilizer. 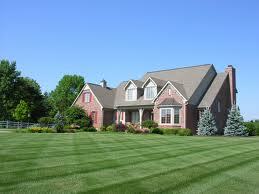 You will have a nice green healthy lawn that will be better able to withstand dry spells and also fight off weeds. Some fertilizers call for lots of water afterwords while others require a dry spell. Either way follow the instructions to avoid burning your lawn. 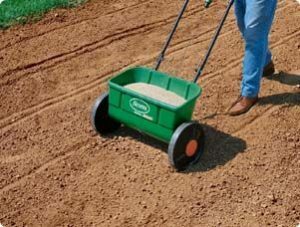 Also use a proper spreader and avoid spilling fertilizer on your lawn in concentrated amounts. Another trick to a healthy lawn is to keep the lawn clear of debris such as leaves, branches and other material that might impede the growth of your lawn. Weeds seem to grow every where and are able to survive in the driest conditions. Many municipalities are cutting back on pesticides and limiting what you can purchase at stores to kill the weeds in your lawn. For many people this is a good thing, especially if you are concerned about getting sick from these chemicals. For the last two years, I have just carried a small blade with me to dig out dandelion roots and other weeds. So far I am ahead of the game. NO weeds, no chemicals and less cost! I just dig them out as I see them while I am cutting the grass. It takes a little longer to mow the grass, but that is ok with me. Water is important for lawns, both too much and too little. Too much rain and you get mold, mushrooms and rot in your lawn. Not enough and it gets dry, dead looking and very thin. These are excellent conditions for weeds to take over since they seem to thrive in all conditions. If your lawn is looking dry give it a good watering so that the roots get a chance to replenish the roots and the blades above ground. Let the grass grow a bit longer before cutting it to provide more protection and guard against evaporation. If water is inexpensive and not limited by the city, water every day in the evening. This ensure less evaporation and more water for the grass. A strong root system, deep in the soil and a thick mat will ensure that your lawn can withstand dry spells longer. When it is growing quickly, cut it often, when it is growing slowly cut it less often and allow it to grow a bit longer that you normally wood. We talked a little bit about cutting your lawn earlier in this post. Never allow your lawn to get too long without cutting it. It is hard on the grass, hard on your lawn mower and more work for you if you have to cut grass that has grown too long. Cut it more often so the lawn can easily recover, unless you are going through a real dry spell and you do not want to water your lawn. Make sure your mower blade is sharp and not tearing the lawn. This makes for a nice even looking cut and a more tailored look. There are many opinions about whether you should mulch, bag or allow your grass clippings to mix in with the grass. Bagging your grass is the most work and your city needs to collect the grass weekly or you need some place to dispose of it. Mulching your grass as you cut it means you are leaving the grass on the lawn in very small particles. It will disintegrate quickly allowing the nutrients to go back into the lawn. The mulch also insulates the lawn and provides protection from evaporation as well as makes it more difficult for weeds to grow. The only drawback of mulching is really that you should cut the lawn more often than normal since a long grass lawn is very difficult to cut while mulching. Your lawn mower can do a really good job and you will also not have obvious lawn clippings on your lawn. The same goes for just leaving the grass clippings on the lawn, Cut it often to avoid having to rake the lawn. Sometimes when cutting a lawn that has been allowed to grow too long, the grass will coat the lawn and block the lawn from getting any light. Cut often and you will have a great lawn minus the weeds. In summary, cut often unless it is dry, do not cut it too short, fertilize 4 times a year following the proper instructions, keep the weeds down even if you have to dig them out yourself, keep the lawn clear of debris such as leaves and water often enough depending on local conditions to maintain a healthy lawn. Please feel free to leave your tips regarding keeping a healthy lawn! For more posts about lawn care and having the perfect lawn, click here.